The Sandstone Ridge Trust has been awarded Heritage Lottery funding to lay the foundations for the long-term management of Cheshire’s Sandstone Ridge for the benefit and enjoyment of present and future generations. One of Cheshire’s most distinctive landscapes, the Sandstone Ridge covers 20,000 hectares of elevated hills and sandstone escarpments stretching between the Mersey Valley and rural north Shropshire. It provides a living for over 400 farmers and landowners, and is the chosen location of over 1,000 businesses. More than 25,000 live in the area, whilst in excess of one million visitors a year are attracted by its peaceful countryside, picturesque market towns and villages, panoramic and long distance views, abundant wildlife and heritage experiences, and opportunities for outdoor recreation including the 55km long Sandstone Trail. The Ridge is a dynamic, living, rural landscape shaped by centuries of activity by farmers and foresters, estates, businesses and communities and it will continue to evolve in ways that we can’t always predict. Its special qualities cannot, therefore, be taken for granted and it is in everyone’s interests to work together to look after the area so that we may all continue to enjoy its many benefits. The Ridge does not have a national accolade such as a landscape designation, nor any overarching management structure or plan that pulls all strands together and focuses everyone’s interests and efforts. This new funding awarded to the Sandstone Ridge Trust presents an opportunity to create a strong partnership and strategic management framework that can promote the area’s qualities, and secure the necessary long-term financial and community investment to create an attractive environment in which businesses and local communities can continue to thrive. Join up the efforts of partners, agencies and administrators so as to use resources to best effect. 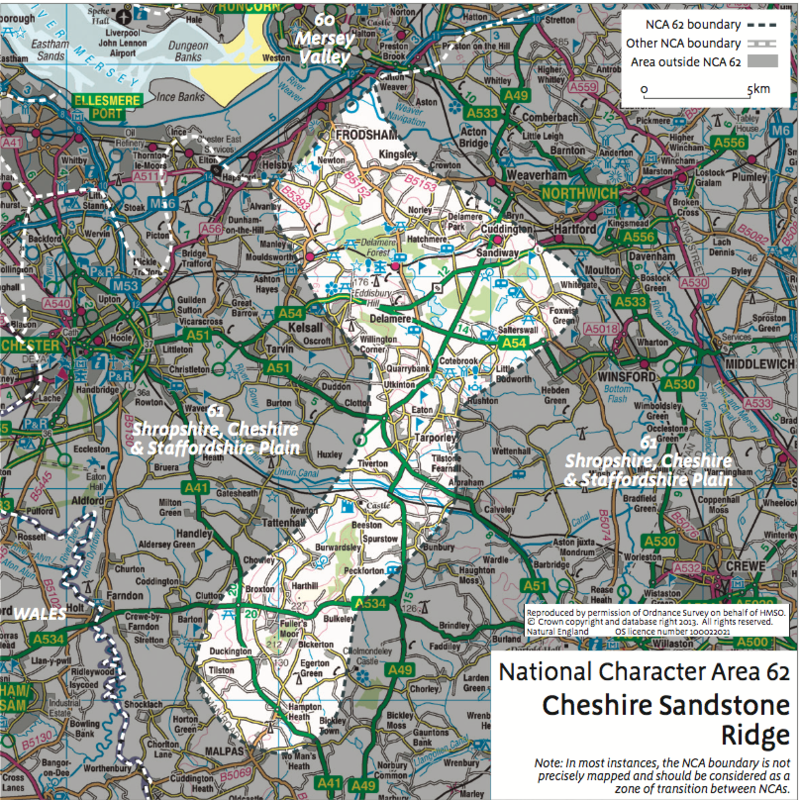 The boundary of the project area is National Character Area 62, as defined by Natural England.